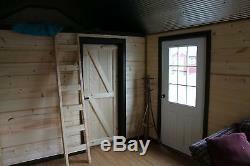 Brand New custom Amish built 12x18 tiny house. Specifications that are included in the price are as follows. 5- 4 x 4 pressure treated skids. Floor is 3/4'' Smartfloor with 2 x 4 floor joists 16 on center. Walls are 2 x 4's 16 on center. 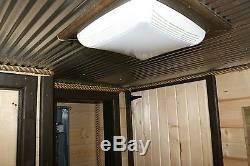 Rafters are 2x4's 24'' o. Prehung 9 lite steel mandoor. 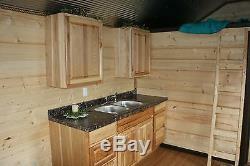 7/16 OSB sheeting with 30-year architectural shingles. 2'' foam insulation in floor. Fiberglass R-13 walls and roof. 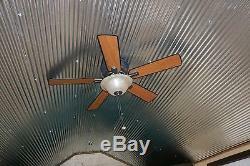 Corrugated metal ceiling with rope trim. 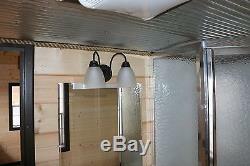 Shower with enclosed glass enclosure. 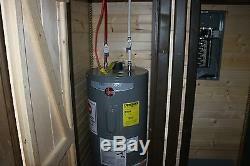 40 gallon water heater with pex plumbing. Loft over bathroom with ladder. Additional options are available however may increase the overall price of the structure. Call 419 895 1998 with any questions. Most of our deliveries are in OH, PA, KY, IN, and MI. WE DO NOT DELIVER OUTSIDE OF A 300 MILE RADIUS FROM 44878. Please Note that we only deliver M-F. All prices are for a fully pre-built structure, therefore we would need sufficient access to your site. Deliveries are completed with a "mule" which can get into tighter spaces however we would still need sufficient clearance to get the structure into place. If you have a lower price from a local dealer we will do everything we can to beat it. 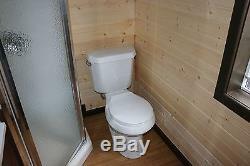 We are an actual builder so our prices are extremely low. 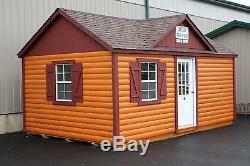 The item "Tiny house for office or backyard studio, one of a kind with knotty pine" is in sale since Friday, April 28, 2017. This item is in the category "Home & Garden\Yard, Garden & Outdoor Living\Bird & Wildlife Accessories\Birdhouses". 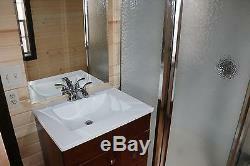 The seller is "mylakeside" and is located in Shiloh, Ohio. This item can be shipped to United States.